Marshmallow root is a natural herbal supplement derived from the Althaea officinalis plant. This supplement is available over-the-counter in a variety of forms including tinctures, extracts, cough syrups, creams or ointments and capsules. Talk with your medical provider about the benefits and side effects of marshmallow root before you begin taking this herbal supplement. Marshmallow root provides a number of purported benefits, which include reducing inflammation associated with asthma, sore throat, bronchitis or cough, skin irritation, stomach ulcers or inflammatory bowel diseases, according to the University of Michigan Health System. Additional clinical research is necessary to further examine the efficacy and safety of using marshmallow root as a treatment for these conditions. No adverse side effects are generally associated with marshmallow root supplementation. If you have diabetes, consult your doctor before using this supplement. Marshmallow root may reduce your blood sugar levels, RxList warns, which may lead to symptoms of hypoglycemia in people taking medication to control their blood sugar levels. The recommended dose of marshmallow root is 6 grams daily for adults, according to the University of Maryland Medical Center. 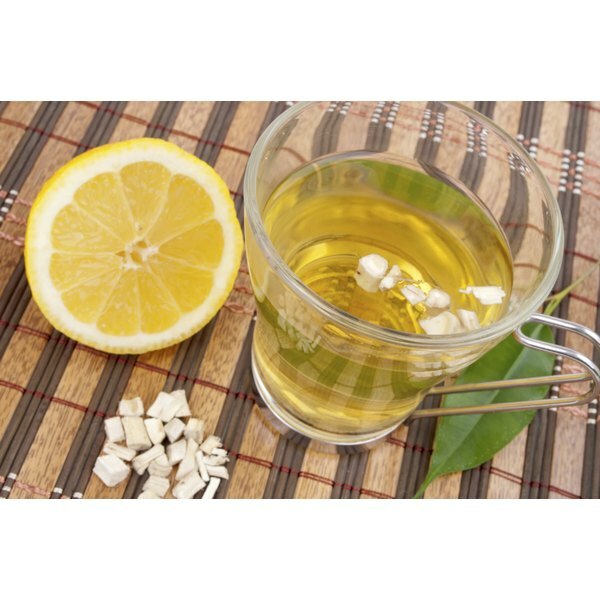 You can prepare this supplement as a root tea by allowing 2 to 5 teaspoons of dried powdered marshmallow root to soak in hot water for approximately 60 minutes before drinking. Consuming 1 to 2 teaspoons of root infusion may also help soothe an irritated throat or reduce cough symptoms. Capsules, cough syrup and ointment or cream may also be used as directed to elicit the beneficial anti-inflammatory properties of this supplement. Consult your physician if you have any questions about the proper use of marshmallow root supplements. Talk with your doctor about any other medications or supplements you are currently taking before you begin treatment with marshmallow root. Marshmallow root is a source of soluble fiber and may affect how your digestive tract absorbs ingested medications. Whenever possible, medications should not be taken with or at the same time as marshmallow tea, advises the Flora Health Herb Encyclopedia. Due to limited safety data, women who are pregnant or nursing should not take marshmallow root unless otherwise directed by a medical professional. Avoid this supplement if you are scheduled to undergo surgery anytime during the next two weeks.